The Scottish Diamond is a contemporary, romantic suspense novella by Helena Fairfax, which follows on from Palace of Deception. However, both books can be read as stand-alones. With a little more darkness and mystery in The Scottish Diamond, we find Elizabeth and Léon in Edinburgh as Elizabeth’s life returns to the norm, after having to impersonate to be the royal Princess Charlotte in Montverrier (Palace of Deception), albeit with her bodyguard in tow! Although a romantic suspense, Helena Fairfax takes us on a darker mystery than we are used to with The Scottish Diamond novella. Now back in Edinburgh with Léon, her former bodyguard, Lizzie’s life has to return to her normal routine with working with her theatre production company, rehearsing and preparing for term time when the schools open up after their summer break. And, what a huge difference it is being back after spending the summer impersonating and covering for the Royal Princess Charlotte of Montverrier, with the beautiful scenery and a suspenseful meeting of her bodyguard in Palace of Deception! Lizzie notices Léon’s faraway looks as he stares from her bedroom window, not to mention the intensity he radiates. Wild thoughts go through her mind about whether he will enjoy being in Edinburgh, or whether he even loves her enough to stay. To make matters worse, the play she is to rehearse for is the dreaded MacBeth. Isn’t it just a whole load of bad luck, especially to those performing it? The superstitions worsen as Lizzie overhears suited men speak in the language of Montverrier, possibly mentioning Léon’s name. Is she being paranoid? Meanwhile, Léon is struggling to find work and failing at interviews. Everything seems bleak and solemn. 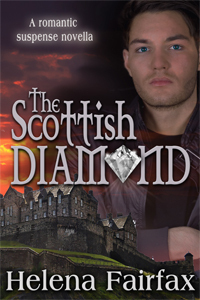 The mood of The Scottish Diamond is in complete contrast to Palace of Deception in terms of the setting, the emotional closeness of Lizzie and Léon, and where Palace of Deception focussed on uniting the two main characters and their success, in The Scottish Diamond there seems to be something between them. The reader fears that they will be pushed apart, and feels the negativity that is swamping Lizzie. For a brief moment, this feeling lifts when Léon finds work. Strangely, after having a conversation with some fellow Montverrians he is given the chance to protect The Scottish Diamond. With the diamond about to be exhibited, the previous guard gone missing, and Montverrians that appear to be following Léon, what will become of the diamond? And, what will become of Lizzie and Léon as they get tangled up in the whole fiasco? Regardless of the fears and mystery that the story holds, one of the enjoyable aspects is knowing that it’s very handy (and HOT), having a bodyguard in Léon around. And, I love his protectiveness of Lizzie; his masculinity ready and waiting for any threat. At the same time, he also allows Lizzie to be independent with her work and doesn’t suffocate her. Told in first person from Lizzie’s point of view, the reader shares exactly the same worries as Lizzie; the main hope throughout is that they both come out alive, and together! However, there are twists and ordeals to get through which will keep you turning the pages, desperate to find the outcome. Suspenseful from the beginning, and increasingly as the story unfolds, you’ll love this short adventure that can be read as a stand-alone, or following on from Palace of Deception. It is a story to be read until the very end to be appreciated fully. A copy of The Scottish Diamond was provided by the author in return for a fair and honest review.